Yves Reynaud, who has given new life to historically important TdMs like the Burdel, Payen and Madenié, just issued his restoration of the 1760 Conver deck in a limited edition of 1500. A decade ago, the only historically correct version of this deck on the market was a photo-facsimile of a deck housed in the Bibliothèque Nationale in Paris, published by Heron around 1980. Reynaud has based his restoration on this deck. About fifteen years ago when I started collecting historic decks, the 1760 Conver, printed in Marseille, was the touchstone TdM. 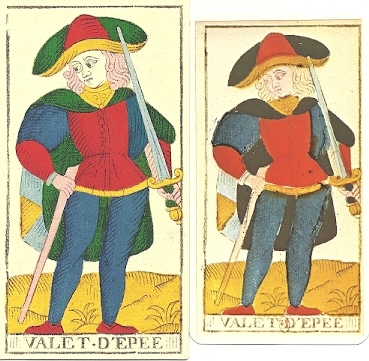 It was considered the first, and the ultimate Tarot de Marseille. We know a lot more about tarot history now, and we have learned the Conver is a relative late-comer based on the Chosson deck printed in Marseille in 1736. There’s an even earlier TdM, the Pierre Madenié, printed in Dijon in 1709. I’m sure the pattern predates this by several decades. Reynaud has published limited editions of both Chosson and Madenié. The Conver deck was printed many times in the 19th century. 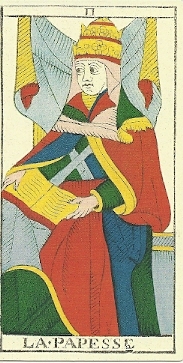 It became established as the standard TdM in 1930 when Paul Marteau inherited the B. P. Grimaud publishing company and printed the Grimaud Ancien Tarot de Marseille, the prototype for most subsequent French decks. This deck also solidified the Tarot de Marseille designation. In the 19th century, occultists used Tarot de Marseille as the designation for any Italian-suited deck printed in France. Presumably this would include variants like the Besancon and Piemontese decks. Playing card historians like Sylvia Mann and Michael Dummett used the term the same way. But the meaning has drifted, and many people now insist that the only decks deserving the Tarot de Marseille designation are decks close to the Conver pattern. Until recently I was an historical purist and a bit of a snob. I only wanted to collect facsimile decks, and turned up my nose at restorations. I found most restorations to be too nice, too clean, and the colors too bright. But recently we’ve seen some wonderfully restored decks that have a special magic and beauty because of their creator’s loving attention to detail. Pablo Robledo’s TdM is one example, as well as the second edition of Reynaud’s Madenié deck, and the work being done by Sullivan Hismans on decks from the late 15th century. This Conver restoration belongs in this group. Reynaud’s restoration is much more readable than the Heron facsimile while retaining its historic look and feel. The colors are strong and pure, and the lines are clean and distinct. One jarring note: Where the Heron version has a flesh or warm beige color, this deck is often very pink, resulting in oddities like pink hair and pink horses. See the Page of Swords from both decks shown here. I’ve read with dozens of historic decks, and I find that one of the most important factors in a deck’s readability are the eyes. They must be bright, distinct and focused. I give this deck high marks for readability. Facial expressions give each deck a predominant mood —some are grumpy or sad, the Madenié is cheerful. Most of the faces in the Conver deck seemed perplexed, worried or slightly quizzical. The cards are the same size and the same quality card stock as Reynaud’s other decks. They are sturdy without being too thick, and with a smooth finish that’s not too shiny or laminated. Instead of the historically correct sharp corners, this deck has very subtly rounded corners that make it easier to shuffle. This detail is so subtle, I didn’t notice the corners until I saw it mentioned on the website’s video. The deck is housed in a very sturdy box and comes with informational cards in French and English with the copy number. Here’s your chance to obtain an elegantly restored iconic deck. Yves is fantastic. I own the Tarot de Pierre Madenié, Dijon 1709. Wonderful. The Madenie is my favorite TdM of all time and one of the decks I read with the most.